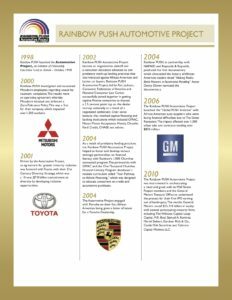 Since 1999, the Rainbow PUSH Automotive Project has made tremendous inroads toward improving access to opportunities in the automotive industry for people of color. Below is broad overview of some of our many accomplishments. Click on the image below or click here to view the PDF.